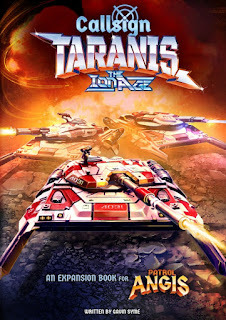 The Ion Age Blog: Callsign Taranis pre-order offers and bundle now live! Callsign Taranis pre-order offers and bundle now live! In Callsign Taranis you will find the expansion rules covering the use of Vehicles in play as well as Structures and other bolt on mechanics. There are also game statistics for the vehicles of the Prydian Civil War and additional skills, equipment and items for your troops. Following on from Patrol Angis is part two of the Prydian Civil War background. Also in this book is the Support Phase and the Between Games development of your forces. Rules for how to play larger games of Patrol Angis and how to generate random terrain. A bolt on section for Building your Forces with Vehicle and Mixed platoons. This and more all in a packed sixty four pages! 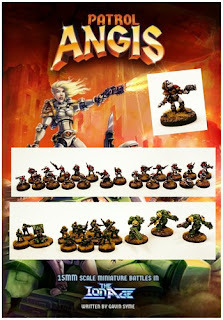 15mm Wargaming! The time is here! 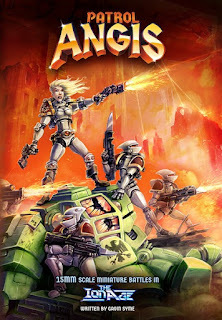 The awaited expansion to Patrol Angis has arrived! Time to get your pre-orders in for the expansion to Patrol Angis which brings in the big guns, the bigger games, the vehicles, the structures and much more. A selection of offers saving you 15% as well as some extra items too. The offers run from now until Monday 20th June at which time they will end at about 9am GMT. The offers apply to not only the new book but also the new larger format version of Patrol Angis plus the game pack and also a two book bundle. All the bases are covered! Go HERE or read on. There is a lot in the new book so if you would like to read all about it and see example pages please visit an article on our blog HERE. 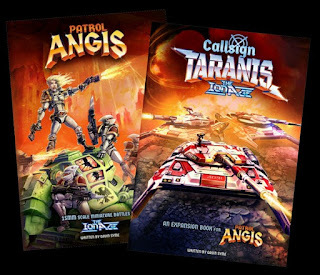 IAB01 Patrol Angis Game Book (68pp) A4 Format. 24.00GBP save 15% = 20.40GBP plus 250 Additional Reward Points on your account! Go HERE. Remember there are links to download free files on our 15mm Publications page if you would like to know more. Every order placed during the Early Supporter period which contains one or more of the promoted special price items will ship out worldwide during the week commencing 20th July 2016. Your orders will be mark fulfilled and packed waiting to send before this. Any orders which DO NOT contain these items will ship out worldwide as normal after being fulfilled. The 15% discount is already applied to the promoted items and is on the screen you need do nothing more than place them in your cart. If you order the two book bundle you will get an additional 250 Reward Points which we will manually add to your Sloyalty total with us when your order is fulfilled but before dispatch meaning you can use these points (which are IN ADDITION to those earned on the qualifying order) almost right away. Every order placed as usual gains Reward Points and will be supplied with one casting of the monthly free miniature (worth 0.60GBP) which is currently the IMP34 Happyburger Clownbot. You can learn more about this bot HERE. Thanks for reading and for supporting my new book.